Fishes are cold blooded animals. Thus, they cannot regulate their body temperatures as efficiently as mammals do. The body temperature of fish is mostly affected by the temperature of the environment. The inability of the fish to regulate their body temperature makes them highly sensitive to changes in the temperature of the water. Even slight changes can cause dire ramifications to their health. Selecting the best aquarium heaters give you the ability to control and monitor the temperature of the water. With this, you can provide the fish in your aquarium with the best environment for them to live and thrive. 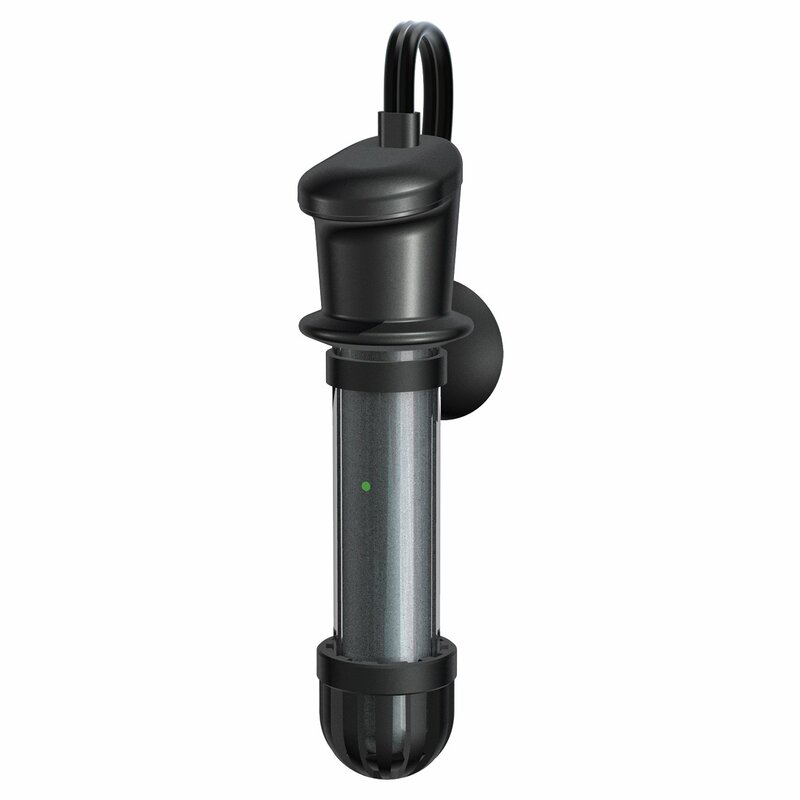 This fully submersible aquarium heater utilizes a strong quartz glass. This allows it to deal with the common drawback with using glass submersible aquarium heaters—their being fragile. This aquarium heater is both explosion proof and shatter-resistant—a testament to how durable this product is. Unlike conventional heaters, the Lineba Aquarium Heater has an accurate thermal control that allows users to adjust the temperature of the water between 16°C~34°C depending on what you require. Easy to install. 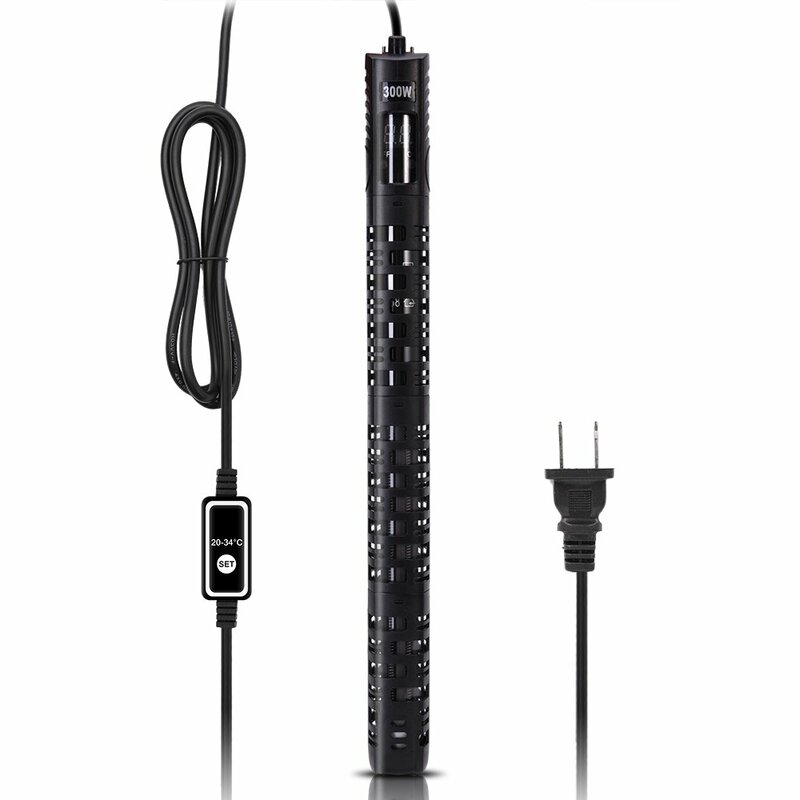 Submersible aquarium heaters, in general, can be installed quickly. However, the Lineba Aquarium heater stretches the limits more by providing a suction cup. Durable. Shatter resistant and is the most durable among glass heaters on the market. Has a protective outer sleep. This adds to its durability. The plastic sleeve protects the glass further from any damage. Issues with instability. Some users report that their unit produces unstable temperature. The WOLFWILL aquarium heater compares with Lineba but at a lower price. Also, the WOLFWILL operates at 300 watts—a hundred watt less than Lineba. This heater is fully automated. You can set or predefine a temperature, and it does the rest of the job. Also, you can predefine a value for the lowest temperature of the tank. When such a temperature is reached, the heater automatically turns on and regulate the temperature. The built-in safety feature powers off the unit whenever it’s out of the water if your tank has a water shortage. Furthermore, it protects your tank from overheating thus allowing an ideal environment for your fish and other aquatic creatures in your tank. Fully automated. It can power on or off by itself whenever set conditions are met. Built-in safety features. You can never go wrong with this unit. It automatically powers off when removed from the water or when water levels in your tank fall below an ideal value. Manual is written in poor English. You’d need the manual for various situations including installation and troubleshooting. However, it’s written in the incomprehensible language. Durability issues. Users report that their units broke down after a few weeks. If your heating needs are not that complicated—say you want to maintain water temperature to just 78° F—then this unit is for you. It’s cheap, lightweight and small—perfect for aquariums with 2-10 gallons of water. It has a built-in suction cap, and you can install it however you want—vertically or horizontally. It will work just as fine. As what you can expect from submersible heaters, this one is cheap. In fact, the Tetra HT Submersible Aquarium Heater is the most affordable of the heaters featured in this article. Indicator light. Informs you when the unit is turned on or not. This serves as a bit of a safety feature. Built-in thermostat. It keeps the water at 78° F.
​Can be installed quickly. Installing is a breeze and gives you a lot of installation options. Durability issues. Some users report that their unit stopped working after more than two weeks of use. Say you want a submersible aquarium heater and you want it to be very precise. The Aqueon is right for you. It allows adjusting the temperature to as accurate as 1 degree. It also sports a safety feature that allows it to turn off whenever out of the water and when overheating. Because of its construction, you can use this heater in either a freshwater or saltwater aquarium. One remarkable feature of this heater is the length of the power cord. With short power cord, you either buy an extension cord or position you fish near an outlet. At 6-foot power cord, you can just place your aquarium anywhere you want. Has a lifetime guarantee. You can have your unit replaced after it broke down. Ideal for both saltwater and freshwater aquariums. Durability issues. Some users report that their units broke down after a week of use. 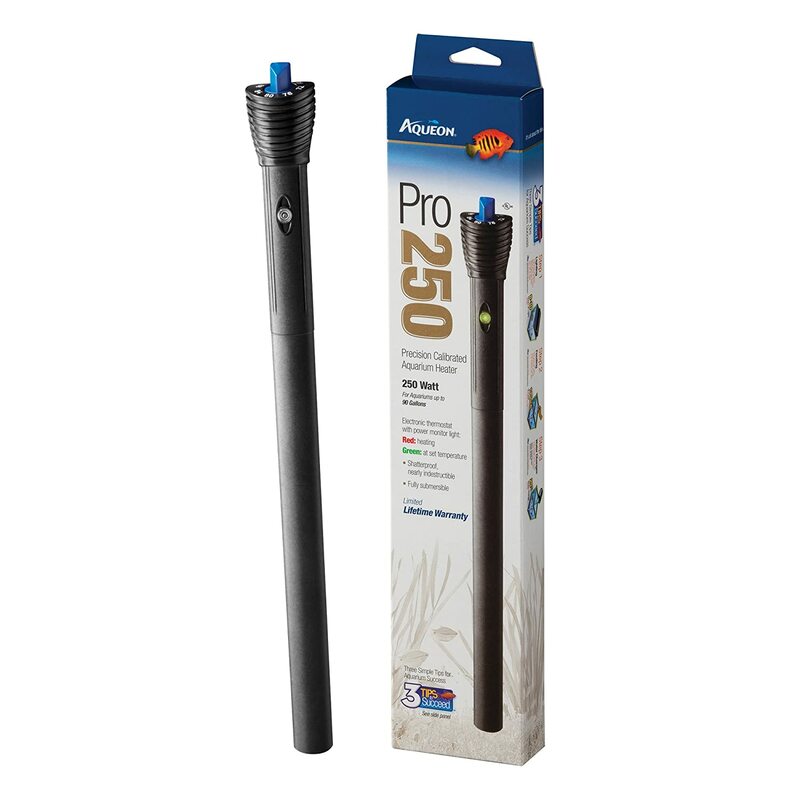 Like its predecessor, the Pro version can be used both in freshwater and saltwater aquariums. Furthermore, this heater is fully submersible. The light indicator tells whether the unit is turned on or off. Issues with construction. Users report seeing substance leak from the unit affecting the fish in the aquarium. The body temperature of fishes follows closely that of the medium. If you increase or decrease the temperature of the water, the body temperature of the fish soon follows. This has a profound effect on their health. The ideal temperature for a fish differs from species to species. Fishes that typically lives within the equator are used to warmer water compared to those that live close to either the South or North pole. An unstable environment—one that rises or falls in temperature over a short period—can send the immune system of the fishes in disarray. A weakened immune system exposes the fish into many infections. In addition, sudden and frequent temperature changes can affect the swimming ability of the fish as well as their growth. If not adequately addressed, an environment with unstable temperature can be fatal to the fish. Currently, there are four types of heaters available. Each has their set of advantage and disadvantages. What to select depends on many factors including the size of your aquarium, the type of fish you have and your budget. This aquarium heater is the least favorite among the four types because of the difficulty involved in installing it. This is because you can install it above water. Among the types of aquarium heaters, however, the immersible aquarium heater is the cheapest making it the ideal choice for those who are on a tight budget. In addition, most people buy and keep an immersible aquarium heater as a backup. This type of heater is the newest one. The filter aquarium heater is placed in the filters. As the water passes through the filters, this heater warms it up. Because you don’t need to place or submerge any equipment inside the aquarium, the filter aquarium filter is among the filters that most users prefer. Also, the way this filter operates makes it ideal for large aquariums with a lot of water in it. For those who intend to encourage plant growth inside the aquarium, the substrate heater is the best choice. This is because substrate heaters are known to promote plant growth. You can install substrate heaters in the substrate—the material you place or use in the bottom of the tank. The substrate hides the heater, so there’s no visible heater hardware in the aquarium. In addition, because of its placement, it allows a uniform and gradual increase in the temperature of the water thereby providing an ideal environment for your fish. Of the types of aquarium heaters mentioned in this article, this one is the most popular. That is because it’s relatively cheap and can easily be installed. If you’re not comfortable with visible heating hardware inside your aquarium, this type of heater is not for you. 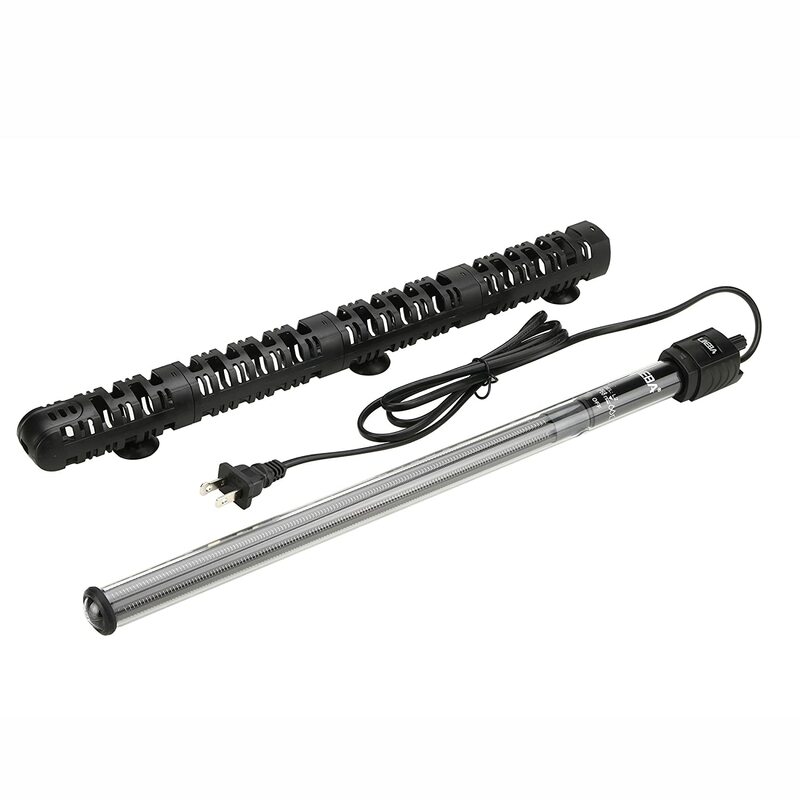 You place submersible aquarium heaters under water—thus the device is highly visible. 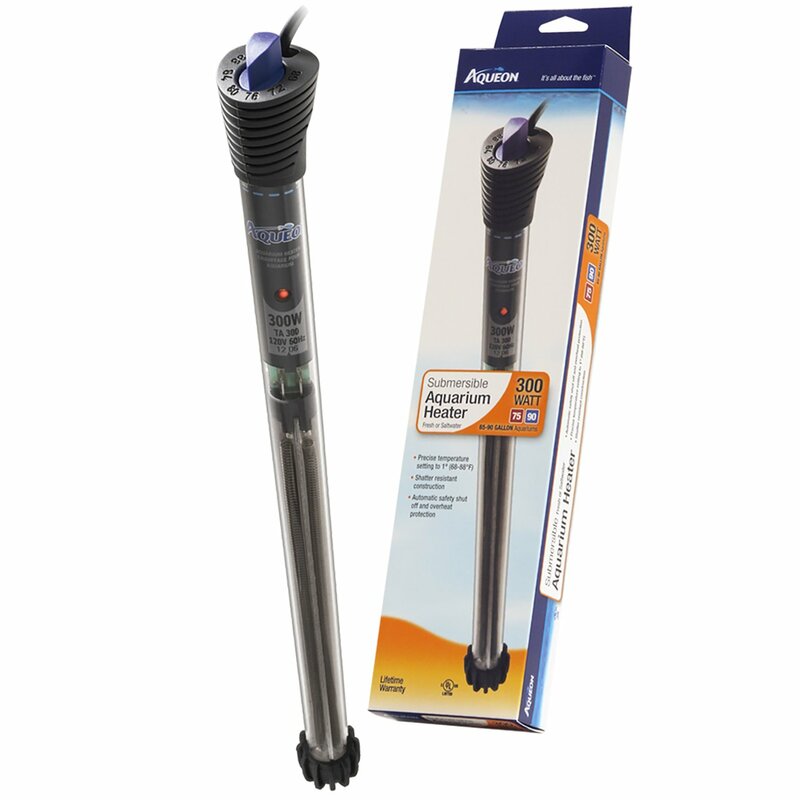 Price for value, the best aquarium heater is the Tetra HT Submersible Aquarium Heater. It’s small but robust, it does what it is supposed to do, and the most important aspect is its cheap. Another attractive feature of this heater is the number of installation options. A unit as versatile as this can fit into any aquarium or tank. Although there are issues with the durability of some units, the company offers limited warranty and replaces defective units. Also, since this unit is cheap, it’s readily replaceable. If you don’t want the inconvenience of having to replace a heater when you least expect it, you can buy another or two as reserves. Do you like our review? Do you have a great experience with a heater not mentioned in this article? Let us know in the comment section below.